Opened in October 2008, the Good International Hotel (Guangzhou Guode Guoji Dajiudian) is located in the heart of Tianhe Central Business Center, 20 minutes' drive from Pazhou Complex, 40 minutes from Baiyun airport, and very close to the Grandview Plaza (Grandview Mall) and the TeeMall. 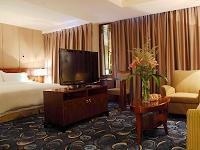 The hotel boasts its luxurious decoration and high class facilities. There are in house swimming pool, parking zone, restaurants, high-class entertainment, sauna and business center. 5 minutes by foot to the Subway Station of ShiPaiQiao, or the Station of "Tianhe Sports Center".